I have noticed an issue with font smoothing on Firefox 3 ever since I upgraded my home WinXP machine last week. Namely, my fonts seem to be "ghosted" by red borders. My guess is that this is some kind of sub-pixel smoothing gone awry. 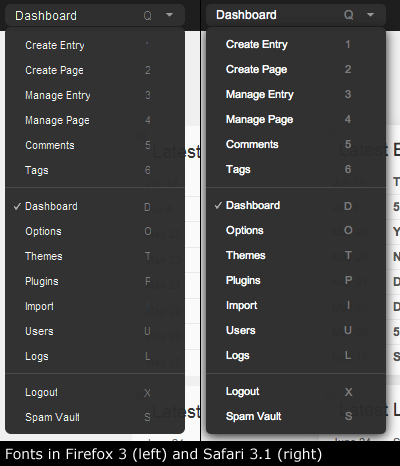 As a matter of comparison, I am showing Habari's admin menu in Firefox 3 and Safari 3.1.1 (I am comparing with Safari because I no longer have Firefox 2 on my machine). In most circumstances, I would say that Safari goes overboard with the anti-aliasing/sub-pixel smoothing, at least with small fonts. However, in this case it clearly looks better. In fact, it looks very much like the menu used to look on Firefox 2. Is anyone else seeing this? I am curious if this is a Cairo graphics problem (newly integrated in Firefox 3) or a WinXP problem. I finally found an existing bug report for this on bugzilla. It seems that it is a cleartype+cairo+opacity problem. Does not look like anyone has a fix for it yet. Actually, i've never seen fonts displayed very clearly on any PC browser. Well, except for in flash. Love to see that change some day. Yeah, I've been scouring the internets trying to find a solution, but I just can't seem to find one. I mean, I can't say that FF3 is all bad, but I really like the font smoothing of Safari - so much so I use it just for that on some sites. i don't seem to have the problem that is being discussed here. i think the problem is with your display system like the rest who are having the same problem as you are. Download cleartype tuner and tone it back. I had the same issue and it was solved by dialing down how much smoothing cleartype does. Just go to your desktop properties -> select font effects and set clear type. This will fix font issues with firefox. @Andy. That worked for me too. here's how I changed the Desktop properties font effects in XP SP3: right-click on desktop and choose properties click on the Appearance tab click on the Effects... button Under "Use the following method to smooth edges of screen fonts:" select "ClearType" press OK and then OK. I didn't even have to restart my computer. Took me quite a while to find this solution. Hats off to Andy for that one and cymerej for the steps! Poor Windows people. I'm pretty sure its just how junky Windows likes to show fonts. I kept thinking I was doing something wrong with my @font-face settings, but the more I surf around on Windows 7 any browser, the more I just think its the nature of junk Windows.